As a 2016 Silver Sponsor of ICT by the Sea, Moncrieff continues to demonstrate our strong history of supporting the educational sector in Western Australia. Great to see so many familiar faces at the conference at the Rendezvous Hotel in Scarborough 4-6 October. With over 150 attendees, eduIT® is Western Australia’s largest education technology expo for IT professionals. This year Moncrieff partnered with APC by Schneider Electric to highlight the risks of unplanned data centre outages. The state-wide South Australia power outage in September impacted 1.7 million residents and an undisclosed number of schools and businesses. During the blackout, hospitals and other emergency services operated using backup generators. Moncrieff provides Data Centre Vulnerability Audits to ensure your organisation can operate in the event of an unplanned power outage. Through the end of 2016, Moncrieff will provide free audits to attendees of the 2016 ICT by the Sea. Congratulations to Lorraine Morrison from River Valley Primary School who won the Moncrieff draw. 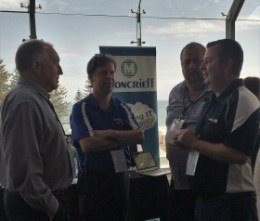 To support the educational sector, Moncrieff is offering complimentary Data Centre Vulnerability Audit for all schools who visited our booth at ICT by the Sea. Schools who did not attend the conference will receive a 40% discount on the Audit through the end of 2016.